GPXSee has a clean and effective GUI layout that does not waste your screen space with unnecessary elements. 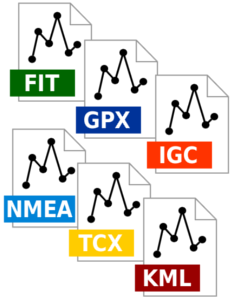 GPXSee supports all main GPS log file formats, namely GPX, TCX, KML, FIT, IGC, NMEA, LOC, SLF and OziExplorer files. 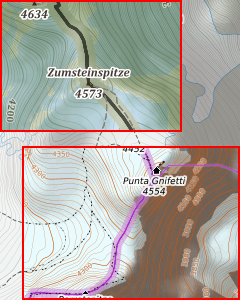 GPXSee supports a large variety of online maps as well as various offline map formats. GPXSee is a GPS log file viewer and analyzer that supports all common GPS log file formats. Opens GPX, TCX, FIT, KML, IGC, NMEA, SLF, LOC, GeoJSON, OziExplorer (PLT, RTE, WPT), Garmin CSV and geotagged JPEG files. User-definable online maps (OpenStreetMap/Google tiles, WMTS, WMS, TMS). 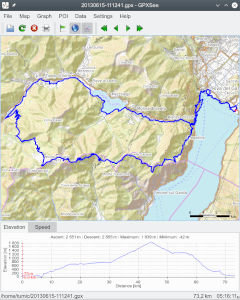 Offline maps (OziExplorer maps, TrekBuddy maps/atlases, Garmin JNX maps, TwoNav RMaps, GeoTIFF images, MBTiles). Elevation, speed, heart rate, cadence, power, temperature and gear ratio/shifts graphs. Support for DEM files (SRTM HGT). Multiple tracks in one view. HiDPI/Retina displays & maps support. Native GUI (Qt) for Windows, Mac OS X and Linux. Free software (GPLv3 open-source license). GPXSee is designed as a small (no dependencies except of Qt), fast and uncomplicated GPS data/map viewer, not a full featured GIS software. However, the spectrum of supported data files/map sources is relatively rich, see the Documentation section for details. Additionally to the source codes, GPXSee is available as a Windows installer and an OS X dmg from the project's Sourceforge page and in form of various Linux packages from the project's openSUSE Build Service page. Most Linux distributions (Archlinux, Fedora, Gentoo, openSUSE, ...) as well as FreeBSD also provide GPXSee in their official repositories, however not always in the latest version. GPXSee supports most tile server based online maps out there, but the list of map definitions distributed with the official packages is limited to a small set of well known global map services. You may however easily extend (or change) the default map list with your own map definitions. There is a community driven GPXSee maps repository on GitHub where you can find a lot of additional map definitions for various map services, usually run by some state geographic institution or a non-profit organization. If you have found a bug in GPXSee, please report it using the GitHub issue tracker. Bugs that are not reported can not be fixed! If you are missing some feature in GPXSee, you may also use the tracker to request it. Bad/missing translations can be fixed directly on the projects Weblate page. Added support for geotagged JPEG images. Added support for TwoNav RMaps. Fixed broken projection equations (multiple corner cases). Fixed IGC date handling issues. Added support for area (polygon) objects. Added support for track segments. Added support for oblique stereographic projections. Added the "Show cursor coordinates" option. Minor bug fixes (GPX parser, GUI). Added support for DEM data (SRTM HGT files). Improved look&feel in dark styles. Added support for polar stereographic projections + Antarctica map. Added support for GeoJSON files. Windows & OS X builds switched to QtPbfImagePlugin v1.2.